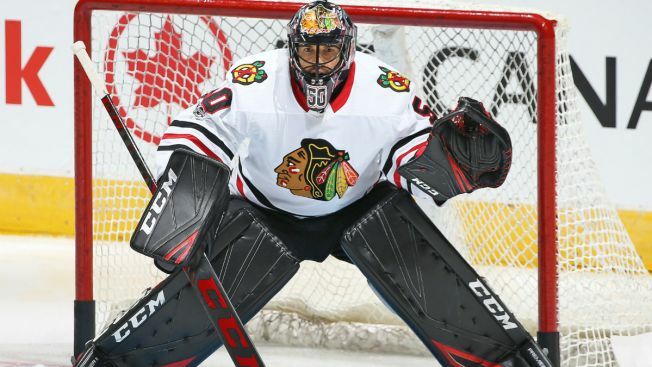 The Chicago Blackhawks will get their starting goaltender back on Friday as Corey Crawford has been activated from injured reserve. Crawford, who spent a week on the I.R. list with a lower body injury, will start for the Blackhawks on Friday night when they take on the Buffalo Sabres at the United Center. In a corresponding roster move, the Blackhawks have reassigned Jean-Francois Berube to the Rockford IceHogs. Berube made one appearance for the Blackhawks in Crawford’s absence, stopping 12 of 14 shots against the Washington Capitals on Wednesday night. The Blackhawks have lost three consecutive games in Crawford’s absence, giving up 11 goals in the process. Anton Forsberg made all three starts in place of Crawford, picking up three losses and earning just one point for Chicago. The Blackhawks and Sabres will hit the ice Friday night with a 7:30 p.m. puck drop. The game will air on NBC Sports Chicago.